Find your dream RV at a dream price with Lakeshore RV Center! As the top RV dealer in Michigan, we offer exceptional customer service, easy financing, and factory direct prices! 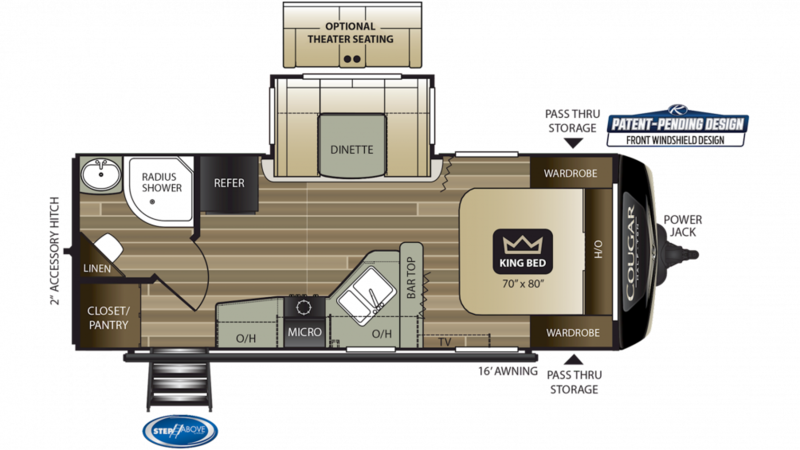 Visit us at 4500 E Apple Ave Muskegon Michigan 49442 or call us at 231-788-2040 to learn more about this Travel Trailer! You'll love every moment with this 2019 Keystone Cougar Half Ton 22RBS! With a GVWR of 7200 lbs, a hitch weight of 630 lbs, and a dry weight of 5590 lbs, this RV can go just about anywhere! After the long trip, sit back and relax outside under the cool shade and protection of the 16' 0" awning! After a hot, dusty day of RV fun, nothing feels better than a relaxing, cleansing shower. You'll enjoy them anytime in the shower that comes with this Travel Trailer. The 60 lbs. of LP tank capacity means plenty of hot water and plenty of holding capacity in the 30 gallon gray water tank. You can skip the long trek to the communal campsite bathroom too, because this Cougar Half Ton has a 30 gallon black water tank. No mess, no fuss with the handy and sanitary Foot Flush toilet either!